Xmas comes early for me – how I love it! 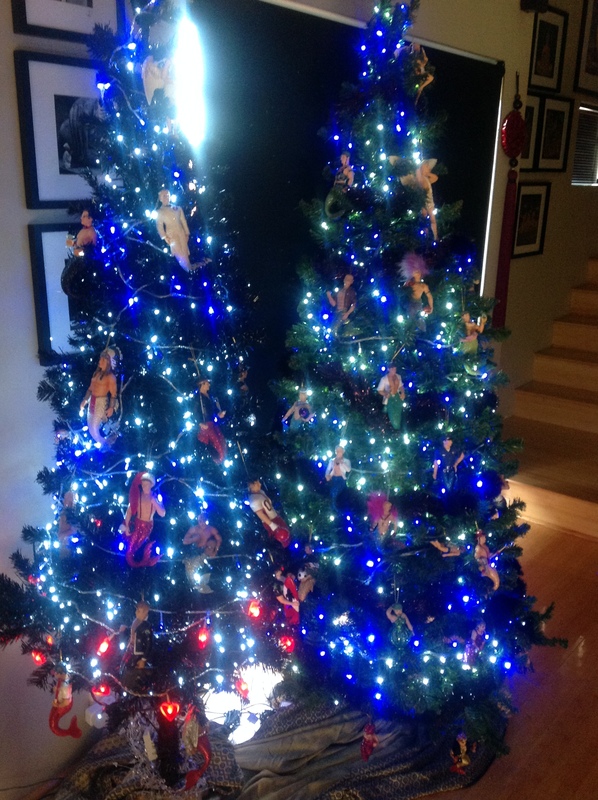 I have always been a lover of all things Xmas, ever since I was a small boy and we used to make paper chains to hang around our lounge room and helping my Dad to put up the Xmas tree in our lounge room! I always seem to be reading articles all over the place about the dread that people feel in having to spend time with their dysfunctional or estranged families and the angst that is causes but for me Xmas holds special memories and is something that I look forward to each year. I love to plan the day and prepare for it well in advance – I suppose that comes from my events background but being prepared is a good thing! On our recent trip to Bali I even purchased all the napkins, table runners and table clothes for the Xmas tables for lunch at my mother and father-in laws place so that everything would be perfectly coordinated and matching! From planning the menu, and who is going to bring what, to sorting out Kris Kringle and thinking about flowers for the day, there is not one part of getting ready for Xmas that I don’t enjoy. Which is why this past weekend I pulled out my favourite decorations and put my Xmas trees up and spent 5 hours putting them up…yes trees is right, you see I have been a collector of these amazing Xmas decorations that I first came across in San Francisco about 7 years ago and since then I have been hooked on them and attempt to get a few more each year. December diamonds www.decemberdiamonds.com create the most amazing ornaments unlike anything I have ever seen before. Trevor and I were shopping in the Castro and came across a little gift shop that had these mermen in the window and I was smitten from the very start! With glittery tails of different colours and with each merman taking on a different look these were just the sort of thing that I loved and straight away purchased 4 of them for that years tree…and that was the start of a love affair with them that has continued as each year the designers add new mermen to the range. This year I left it too late to purchase any new ones and so next year will see me add a bumper crop to my range of 56 that I currently own…I know maybe I am a bit obsessive about it but they just tick all the boxes for me in terms of what I love about a Xmas ornament for a tree. 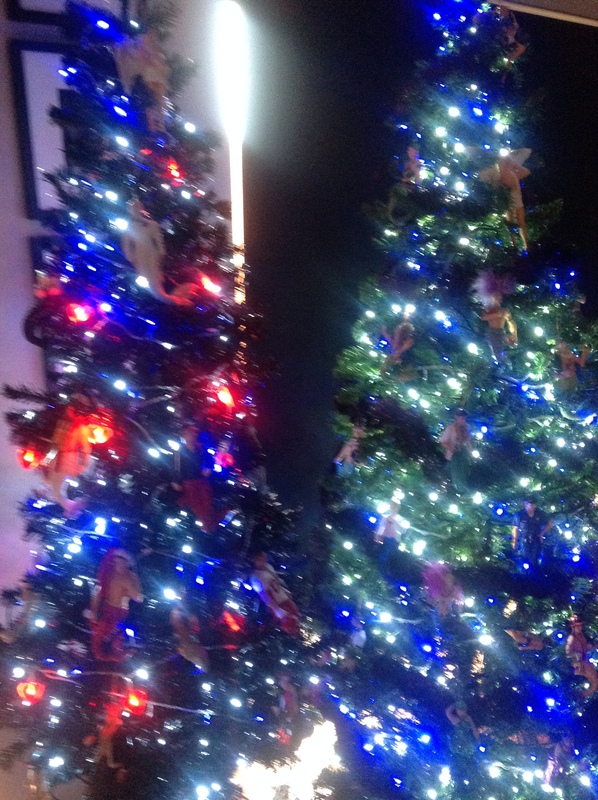 Being a good Virgo man I love a theme, order and a specific way when I am putting my tree together and I quickly realised this year that the one tree that I had would not be big enough to take all the mermen and allow them to each shine in their own way! So I came across a black Xmas tree (yes black!) 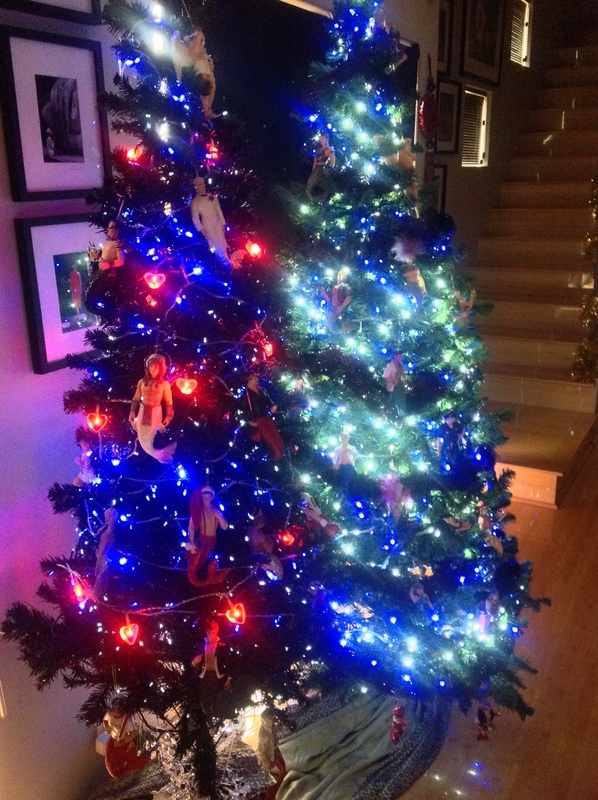 and thought it would look great next to the tall green one that I had…sort of like starting to create a forest of Xmas trees in my lounge room! 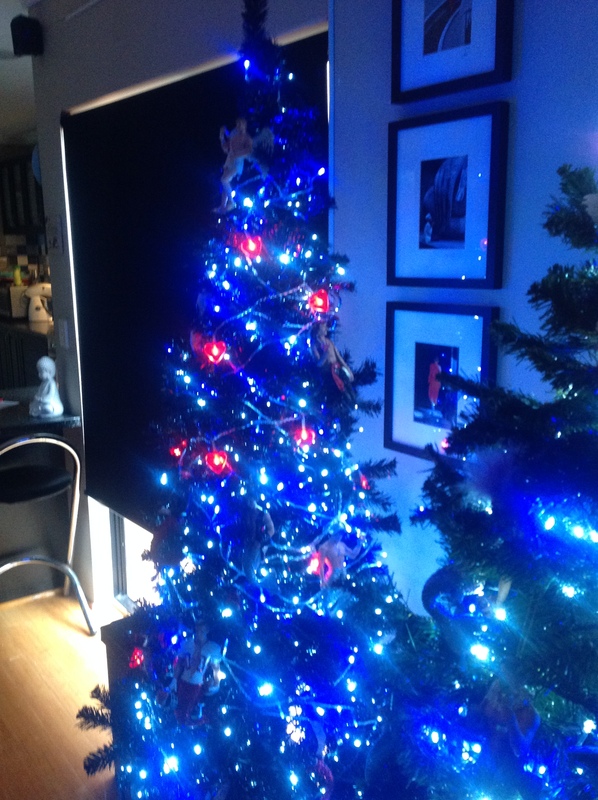 And then of course that meant I needed to also buy more lights to go on the new tree and so Saturday saw us hitting the shops to find some white and some blue LED lights to add to the ones that I had from last year! I had previously put the trees up on the Thursday night just so they could sit unadorned for a couple of days and to allow my cats to get used to having them up and in place…then it was time to string the lights add a little tinsel to the green tree, unpack the mermen and place them and then it was complete! 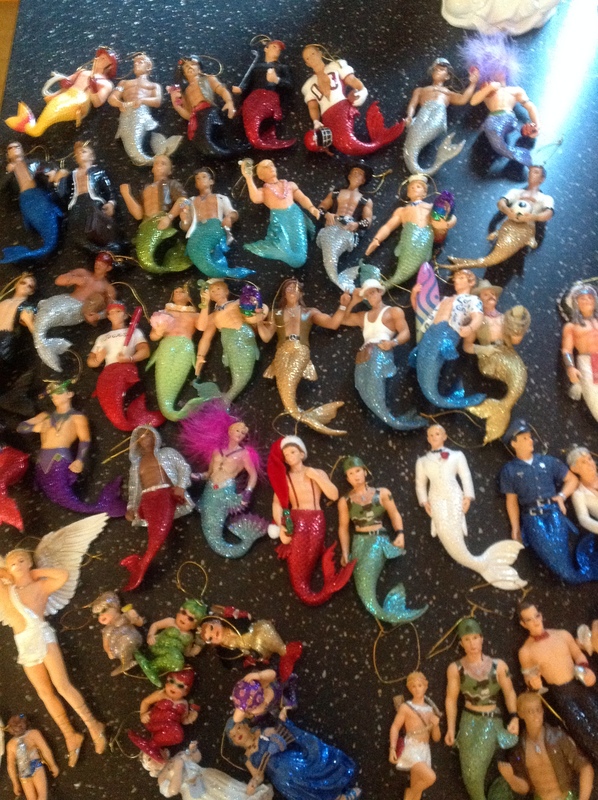 Some may say I am a bit obsessed with my mermen but I just love the designs and they look great on my trees…I love nothing more than sitting in my lounge watching the lights flicker on and off and pick up the glitter in their tails and just to take it all in. I even think I get a more excited about it than my grandsons. My eldest thought it was much too early to be putting Xmas trees up but their faces lit up when they saw them for the first time on Sunday, which was just perfect. Xmas for me is about family, sharing, being and enjoying time but it is also a time to reflect and remember the past year and years and the people that have had an impact in my life. I love to go out and shop for presents, prepare the Xmas meal that the family will share and come home exhausted at the end of the day and just sitting once again to look at the flickering lights and enjoying some quiet after the day that has been! Perugino – a dining institution in West Perth that does not disappoint! Saxony a fashion label for the man who loves to stand out! Great website, keep iit up! I love yours and you have a couple that I had not seen and will seek out when I purchase my next lot.